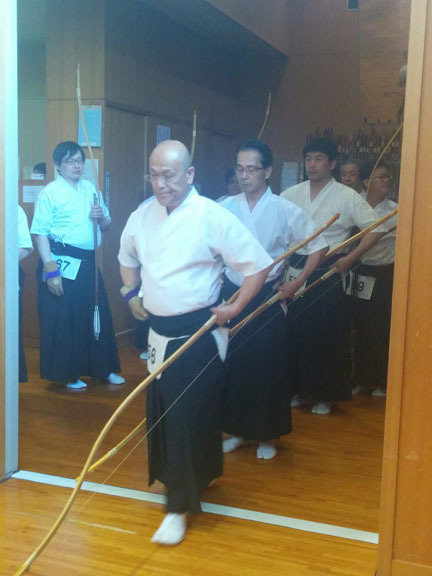 Yeah, not much writing on Kyudo these days, however, it has not stopped. Day before yesterday I went to practice. I did fairly well, a couple of days before that I did better. So I was thinking, ok finally I am making some improvement, small but headway is headway. Like having. Dollar is better than having a dime. I was it getting cocky, but still feeling better at least I was taking a step forward. This was Sat. Sunday There was. Tai Kai. I was thinking ok, well I should do better, not get but better than I have been in a while. Sunday’s Tai Kai, I had a been given a real task to do. Usually I just take photos. I am comfortable with that. I understand that it is my thing. This time I was assigned the job of being a score keeper. 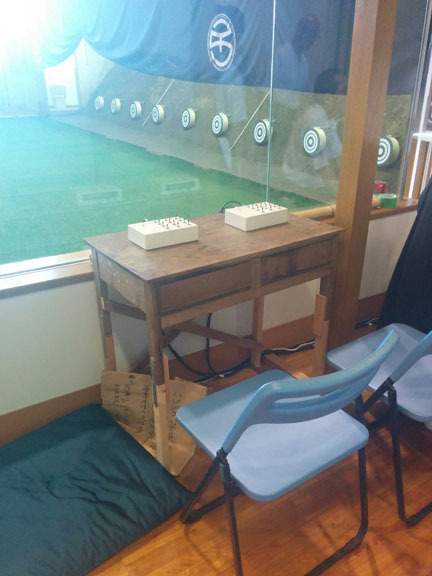 Well a switch flipper, score keeper. I watched, when the shooter hit the target, I would flip a switch and on the light board it would show. I was nervous. Did I understand the directions right. It seemed simple but, what if I made a mistake, what if I could not see clearly when it hit on the side. Another woman and I were to work together. Her first time also, she was also nervous, so I did not feel so bad, but at least she understood Japanese. Mine was iffy. 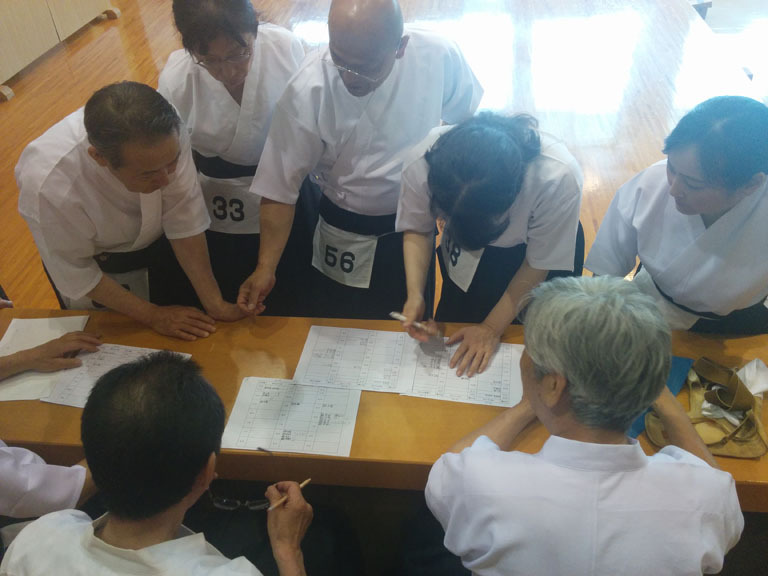 I looked at the switch board the day of the Tai Kai it did not seem to complex. Just flip the switch, X or O, simple at least that part. Did I have it right , O is a hit, X is a miss? Seems like X should be a hit, O a miss, I was thinking too much! Just do it. Another thing on my head was getting there on time. I missed the last Tai Kai, and another time before that, hmmm last year, I was late! This time I was there early, and already dressed. I did at home and worn my Gi on the train. 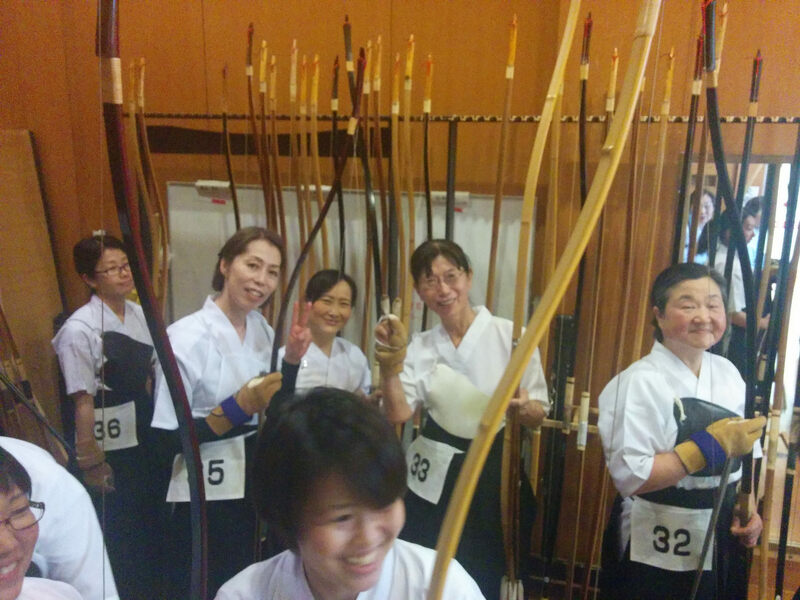 A couple of the lead Senseis, one of which was the Kaicho, said, ohhhh ! You are here early!! Desho ( yup, that’s right! ) I said and we laughed. We all gathered outside before the dojo building opened. I took a few pictures. 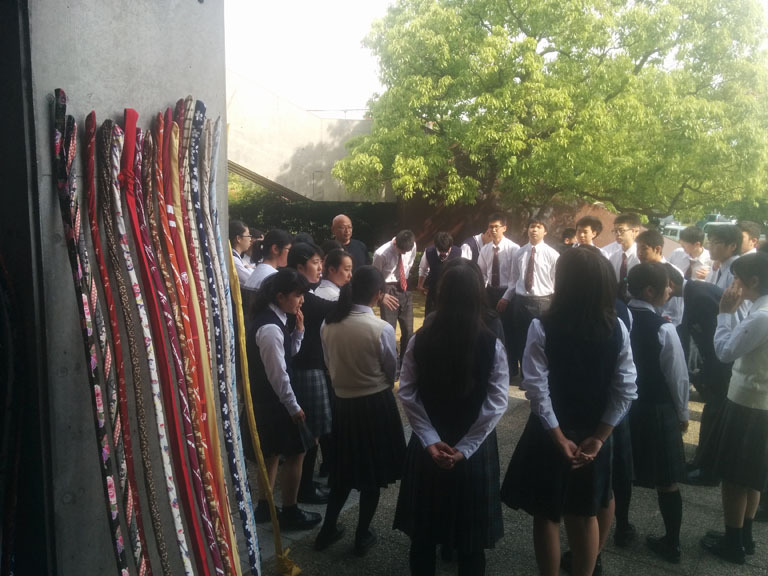 I took a shot of on of the Sensei with his school group. He was giving them directions and whatever else. He saw me taking a picture and said Ohayo! All the kids turned looked at me, bowed and said Ohayo! Wow! I was not expecting that. Kind of shocking! The building opened and everyone entered. I grabbed a spot for my stuff and went to look at my assignment area. My partner also showed up shortly afterward. I had talked with her outside also. Ok, we got some final directions and things were simplified a bit. She had one section I had another. A third person on the other side had another. whew, I was thrown off for a bit thinking we had three sections. The event started, the usual opening stuff, then it was on. At first it was scary, but after a few it was ok, not really a big deal. There were also I found out backups, checking what we posted and another also doing it on paper. So the three should all match. Ok, i felt better and better. Then I found out that I did not have to sit there the whole time until it was my turn to shoot. There were also high schoolers, taking shifts with us. So I really only had to sit there maybe for three or four lines of three shooters, with four arrows each. After that I could hangout or whatever. I used the time to take pictures. I did not bring my Nikon since I thought I would be too busy score keeping. I only had my phone cam, which did not do so well with the sun light coming in at a bad angle. Oh well, I rolled with it. I had one guy come introduce himself to me. I did not really figured out what was going on until afterward. He had said something about a boat, and sailing, and nice to meet me. Afterward, it came to me that he was the one that I had heard about from the boatmaster where I work, had a boat there to get a bottom job. 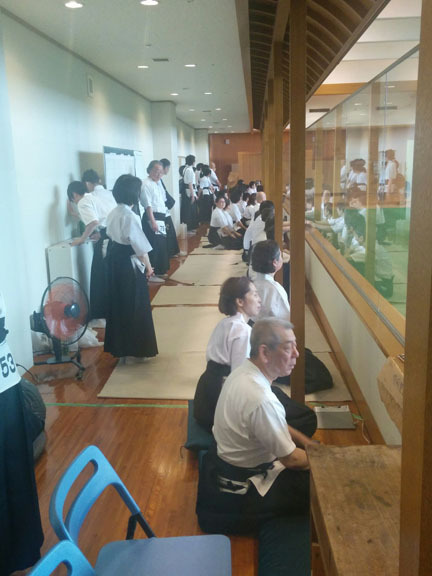 He had seen me then and wondered if I was the gaijin doing Kyudo. So yeah, afterward I got what it was all about. The Tai Kai went smooth. It was not as big as some of the others there at my Dojo, but that was ok. There were 87 competitors. I was #84. I have no idea how they come up that. No matter. I got three round of shooting, four arrows. I got two hits! Sad, but oh well, no matter. More training is needed, but I already knew that. I got to see a couple of classmates I had not seen in a while. One of which has been testing with me for Yon-dan. He was still San-dan also. Another woman who was trying for san-dan was still Ni-dan. Ok, so to is not just me! I felt better, I was not left far behind with my choice not to test for a while. So anyway, the inter action with my classmates is very comfortable these days after almost 4 years. I am really one of the group in many ways now and share some laughs and small chats with some. They tend to look out for me, on things I am not sure of or missing, they have my back as part of the “wa”. For some reason, your writing about being on time (after your previous mishaps) reminded me of the story of the Three Laughters at Tiger Ravine.